The ‘Ālimiyyah Course at JRU is a version of the traditional course that has proven successful throughout the ages and is still a valued system of learning in Islamic educational establishments worldwide. It is specially engineered to cover the key Islamic sciences needed to give an individual a comprehensive and thorough understanding of Islam. The Course is structured around a series of set texts, including a core of sacred texts and classical works, and other graded text books. The course lasts six years, during which students achieve a solid grounding in Classical Arabic and make graded progress through the key sciences of Fiqh (Islamic Jurisprudence), Hadīth (Prophetic Traditions) and Tafsīr (Exegesis of the Qur’ān). Among the other subjects taught are modern Arabic and Urdu at GCSE and A2 levels. JRU is an Edexcel approved examination centre for these courses. Assessment takes place through monitoring written exercises and through biannual examinations. In order to maintain high standards, the pass mark for internal examinations is 60%. Students failing to achieve the pass mark are required to re-sit their exam(s) and achieve a satisfactory result before advancing further in the course. To carry out an in-depth study of the sacred sources of Islam, i.e. 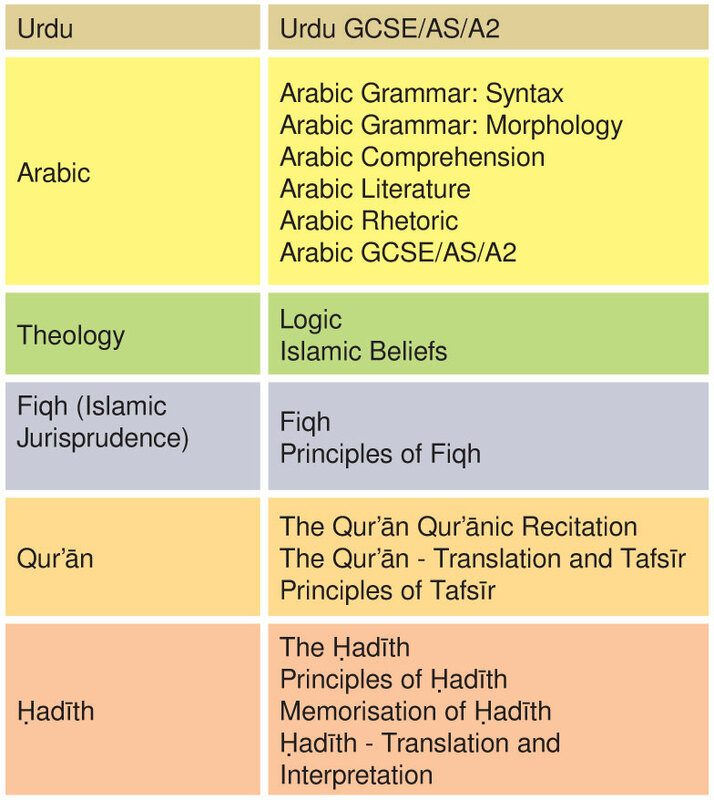 the Qur’ān and Hadīth, and the rulings derived from them in the form of Islamic Law, after gaining proficiency in Classical Arabic. Students are expected to achieve a thorough understanding of Classical Arabic and related sciences. They are expected to understand the meaning and interpretations of the Qur’ān and the major collections of Hadīth and how they apply to the individual and humankind. They are expected to know the principles of how Islamic Laws are derived from the primary sources and have a sound knowledge of Islamic legal rulings. Students are expected to develop familiarity with the vast field of Islamic scholarship, and the skills to research and further their expertise in any particular area.